496 pages | 10 B/W Illus. 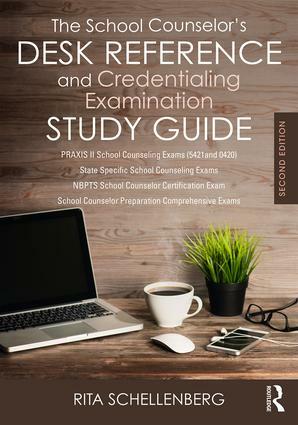 Dr. Rita Schellenberg covers the breadth of contemporary school counseling topics and content to help master's candidates and the highly motivated practitioner to prepare for national and state credentialing exams. Each of the eight chapters provides simulations, case conceptualization, and reflections that frame critical concepts. Additionally, Dr. Schellenberg skillfully uses ASCA’s position statements to illustrate and provide direction to challenging school counseling situations. From clear descriptions and web links for each exam, to standards alignment and integration of the ASCA National Model, this 2nd edition successfully removes the fear factor that causes most of us to shy away from the challenges of national credentialing. Rita Schellenberg, PhD, LPC, NCC, NCSC, ACS, is a professor and the chair of the school counseling program at Liberty University in Virginia. She was recognized by the American School Counselor Association (ASCA) as one of the top 15 school counselors in the nation and honored "Outstanding Graduate" in her PhD program in Counselor Education and Supervision at Regent University. Dr. Schellenberg has authored many successful publications on professional school counseling including, most recently, A New Era in School Counseling (Rowman & Littlefield Publishers, 2013). You can learn more about Dr. Schellenberg, her consulting services, and other published works by visiting her professional website, Cultivating Performance at www.CultivatingPerformance.com.